Juno nominees and winners of the Canadian Folk Music Award for Vocal Group of the Year, Amanda Walther and Sheila Carabine of Dala write and sing in harmony best described as angelic. These two best friends met in their high school music class in 2002; they have since released five albums and toured extensively across North America. Darlings of the Canadian music scene, Dala are now poised to bring their fresh brand of acoustic pop music to the world. The sheer joy with which they perform is infectious, turning first-time listeners into instant fans. Dala are equally entertaining between songs, telling funny and down to earth stories that make every show unique. Dala have opened for artists such as Tom Cochrane, Stuart McLean of the CBC’s Vinyl Café, Richie Havens and Arlo Guthrie. No strangers to the festival scene, they have also performed at The New Orleans Jazz Festival, The Edmonton Folk Festival, California’s Strawberry Festival and Mariposa. 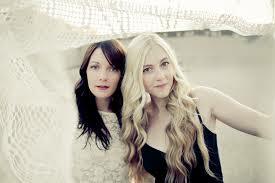 In 2009, they were the only Canadian act invited to play at the 50th Anniversary of the Newport Folk Festival. Dala’s album “Everyone Is Someone” was released in 2009 to critical acclaim. It earned them their fifth Canadian Folk Music Award nomination, a Toronto Independent Music Award for Best Folk Group, and it was touted by The Irish Post as the Album of the Year. The song “Horses” was nominated by National Public Radio in the US as one of the “Top Ten folk songs of 2009”. The live album was nominated for a 2011 Juno Award in the category “Roots and Traditional Album of the Year: Group”. Dala’s latest album “Best Day” was released in June of 2012. It was nominated for three Canadian Folk Music Awards: English Songwriter of the Year, Vocal Group of the Year and Producer of the Year”. TICKETS: Reserved/$25 (first 5 rows), $18/Adult, $7/student child (5yrs-17yrs). Online HERE. Methow Arts in Twisp, 109 2nd Ave (across from the Twisp Feed Store and Valley Video.) CONTACT: Methow Arts, 509-997-4004, info@methowartsalliance.org. Cash/Check only at event please. LOCATION: Winthrop Red Barn, Winthrop, WA. DATE: Sat, Apr 22, 7pm.